Yesterday They Were Businessmen. Today They're Cowboys. Tomorrow They'll Be Walking Funny. Mitch, Phil and Ed are three buddies on the brink of 40. Their mutual mid-life crises have them re-thinking everything important. When Ed, the most financially solvent of the trio, gives Mitch a vacation trip to Colorado, Mitch is initially resistant. He’s a neurotic city-boy. Can he handle a southwestern cattle drive? City Slickers seeks to answer that question. The three men head to a ranch where they have funny, life-changing adventures. They run afoul of professional ranch hands and the cattle drive boss who thinks they’re sissies. 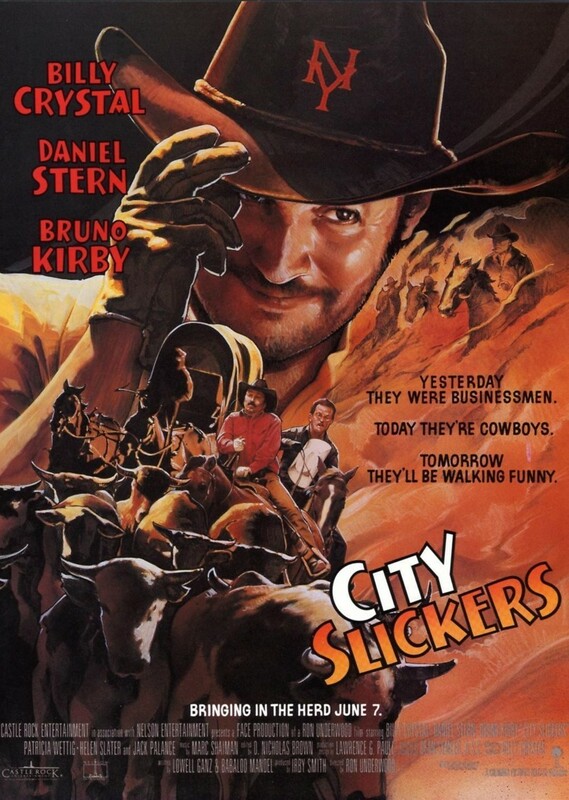 They end up proving their mettle after Curly, the boss, suffers a heart attack, and the ranch hands get drunk. The trio must get the cows across a raging river to safety.